my question is .... if I pot them up to 1.5 or 2 gallon pots (because they are actually a basket variety and are gonna stay in pots) can I start keeping them permanently in a south facing window until May. In other words if I take the artificial light away at this point are they going to suffer and die for a few cloudy days in front of the window in my house? They can go outside when temperature is above 55°F. But you have to acclimate them to being outside first -- slowly. And you need to be able to put them outside after it warms up, and be able to bring them inside if it gets colder than 50°F. It will be even warmer/hotter in the sun. It helps to have some kind of protective environment to shield them from extremes. Where do you live? Will you have day like that soon? I AM -- especially tomato seedling which can go out when 5 degrees cooler... but my seedlings are in tiny seedstarters right now and can't be put outside until they are uppotted so they have sufficient growing medium to buffer for dehydrating effects of sun and wind, as well as be able to withstand a bit of rain without getting washed out. Oh btw, some people do 24 hour/12 hour rotations under the lights, which is a bit shorter than best --14-16 hrs, but better than depriving for hours on end. Overcast outdoors is fine, actually better for getting them accustomed to outdoors than bright sun. Overcast outdoors is SO much more light than anything indoors. We don't realize how dark our houses are compared to outdoors. Stand outside on a sunny day and look in your window! Re: " if I take the artificial light away at this point are they going to suffer and die for a few cloudy days in front of the window in my house?" They aren't going to die. 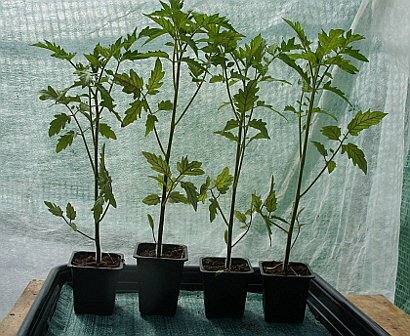 They are very likely to shoot up practically over night from the really nice sturdy plants you have now to twice as tall but very spindly, as they stretch out trying to find light. If you decide to put them outside during the overcast days, I recommend you spray them all over with 1:8 milk:water (de-chlorinated) solution when you first put them outside. This will help them resist cool/damp fungal infection. Chamomile tea and willow bark/branch tip twig tea are also good protective/preventive sprays. Don't spray (anything -- basic gardening rule) in full sun. Very interesting ... I will have to consider that ... are they gonna stink like rotten milk after that ? What does rotten milk smell like? I don't think I ever noticed. When spraying outside, the spray itself smells like fresh milk or yogurt, depending on how much strained yogurt whey I add. When spraying indoor plants, I spray them outside or in the bathtub. Well as an update I did pot two of the three plants up to much larger containers so I will be acclimating them to outdoors and any day it's not in the mid to high 60s they will have to stay in the window ... thanks for the help ... if you guys don't mind if I have any problems can I write back ? I second that! We love enjoying successful gardens vicariously. Also, in gardening, we learn from puzzling out why things aren't working -- not just our own but other gardeners', too. I think thats the best part of sharing our stories like this. BTW, spoiled milk can be used to add nutrients to the soil -- calcium, phosphorus, and the protein breaks down to nitrogen. ... I do have kids, but my older DD has always been particular, and once she declares the milk "suspicious" regardless of expiration or when it was opened and, to me, indiscernible difference, younger DD won't drink it either. DH might continue to add to his coffee if he is out of his flavored creamer, and I might use it for cooking and baking. This "expired" milk is what I will divert to use for milk sprays. So I hardly ever have fully spoiled milk -- never one that actually smells bad. DH has on occasion, discovered expired milk that curdles in his coffee. I use those to water container plants when they are outside or pour in the compost pile. During the cold months, when fresh or expired milk is used up, I rinse the carton with filtered water and blend into the jugs of water for the indoor plants, along with rinse water from juice containers, cold coffee and tea, etc. Can anybody help identify this growth on my window?